Just a few of the inspiring signs at the Houston Women’s March (and one from Moscow, Idaho) — echoing sentiments expressed across around the globe in protest against the inauguration of Dontrump – and his agenda of exclusion and distortion. His hallucinatory address painted a portrait of an unknown land that he kept calling “America” — a world of misery, division and joblessness, so unlike our own it felt confusing, and sad. But, not our problem! His installation has set off the backlash that can now lead to positive change. If we stay woke. What a relief and inspiration to see so many people in the streets, taking up their participatory role in democracy. So smart and funny!!!! The world is emerging from the recent darkness, to the realization that we only really lose when we stop participating. Time to move past the gridlock, to positive change that benefits the 99%. America’s strength lies in our diversity, and in our ability to innovate, to harness the skills and talents of all races, genders, classes, sexualities & religions to invent the better future, not to turn back the clock. Next step: INNOVATE ! and Build toward Progressive majorities in 2018. Get political in your home district & pledge to vote in the primaries & the general in 2018! Work your friends and neighbors to do the same. Talk to your leader-ly friends about running for office — and listen if they talk to you! Join a service organization if you’re not already in one, and be an active force for good in your community, in small ways as well as big. Find ways to be in touch with people outside your circle, regularly. Connect. Smile at people around you, known & unknown — share a sense of appreciation your community! Fight sexist, racist oligarchy, wherever you see it. This essay first appeared in the Houston Chronicle. I teach Gender Studies, and there’s never a shortage of material. It turns out life is a Gender Studies course, and we’re all in this class together. But lately, even more so. Take this election – please! Too bad for him, laying this behavior on thick won’t send his target home crying anymore; everyone now recognizes these moves as attempts at intimidation. But plenty of voters support him anyway. Some like his policy agenda and either choose to disregard the super-boorishness or, worse, they really like it. And then there are some still on the fence, often for reasons not so much to do with policy, but because they don’t “like” Hillary. 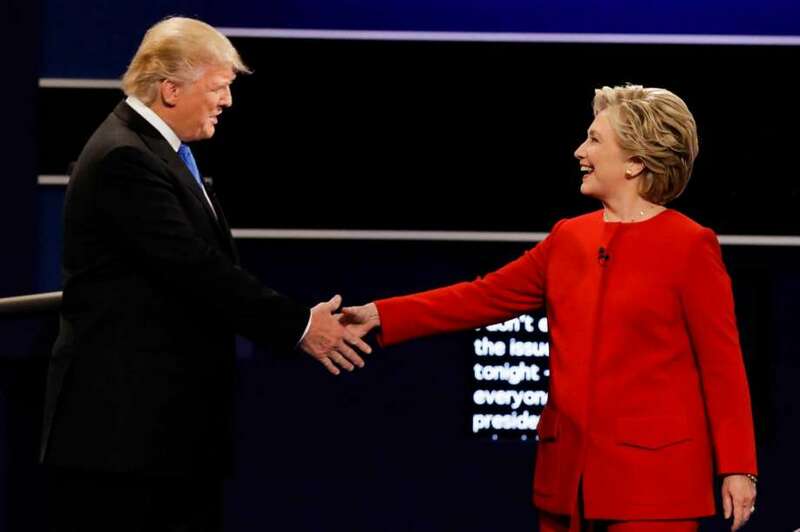 Are you willing to cut the male candidate slack for his behavior as a person and/or in business, but you hold the female candidate to a higher standard? Do you think that 68-year-old women are less vital or less interesting than 70-year-old men? Does your feeling that you “just don’t like her” link to a sense that women shouldn’t be assertive? If you answer yes to any of these questions, then misogyny, which Merriam-Webster unflinchingly defines as “a hatred of women” – recast here as a doubt about women’s capacities (and by contrast, a sense that men are just better and more worthy) – is in play. For ages, the world embraced this set of perceptions. But the old gender rules don’t make sense in the modern economy. As women have become educated, our nation has expanded its talent pool. We now look for the best person for the job – mostly. That opens up doors for millions of young women and men who can now flourish in occupations formerly barred to them. But in some spheres old biases still rule, the realm of leadership in particular. While middle-management jobs split evenly, the gender gap persists among leaders in business and government. Women are 51 percent of the population, but only 4.6 percent of CEOs, 19.4 percent of Congress, and zero percent of our presidents, ever. We’ve heard lots of ideas on why women haven’t trickled up into leadership, including: active harassment, old-boy exclusivity, systemic family unfriendliness, lack of ambition and lack of role models. Whatever the reasons, the leadership gap is a bottleneck to positive change and to the unrolling of democracy. Without more women in leadership roles, you’ll never know what insights and positive innovations they could introduce, both as individuals and as members of a group with a different perspective. Young women will be less inclined to even make the effort to lead, or to learn how to prepare to lead, when they see capable females rejected time and again. If the female candidate loses this election only because we as a society decide we still don’t feel comfortable with female leadership, our daughters and granddaughters, sons and grandsons will feel those negative ripple effects for years. Whatever your politics, unless actively keeping women out of leadership is your goal, take time to make sure you vote for whoever you think is the best-qualified candidate, with the best ideas for our nation – without gender bias. Whatever your views, and especially if you’re on the fence – check your misogyny, at the polling place door. 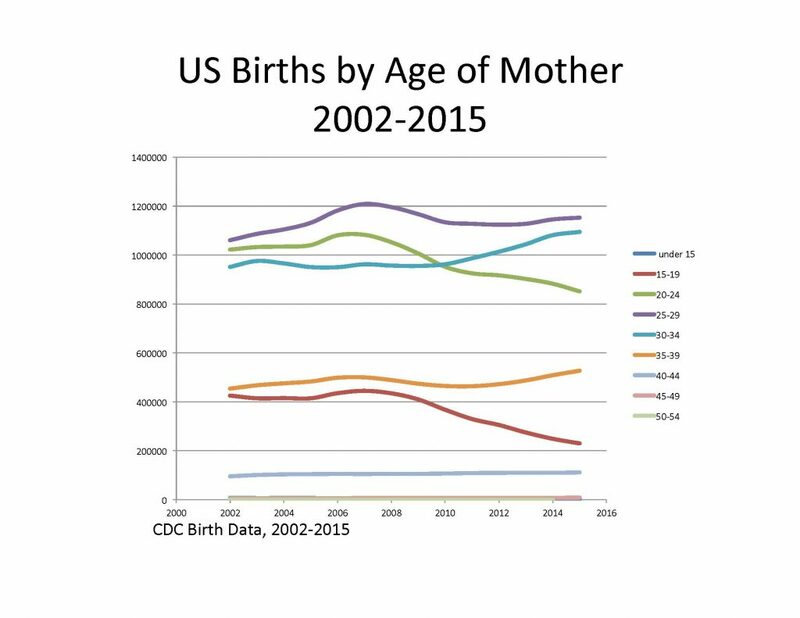 Teen birth rates fell 8% to 22.3 births per 1,000 women, rates for women aged 20–24 fell 3% to 76.8, and rates for women aged 25–29 declined 1% to 104.3 (Figure 2). The birth rate for teenagers declined 46% since 2007, when a brief uptick was observed for this age group. In contrast, birth rates for women aged 30–44 rose from 2014 to 2015. Rates rose 1% to 101.5 births per 1,000 women aged 30–34, 2% to 51.8 births for women aged 35–39, and 4% to 11.0 births for women aged 40–44. Since 2007, the largest increase was for mothers aged 40–44, up 15% compared with rises of 9% for women aged 35–39 and 1% for women aged 30–34. After younger women delay having kids, to finish their schooling and establish at work, among other things, it’s not surprising that they start having them later. “The rate of Texas women who died from complications related to pregnancy doubled from 2010 to 2014, a new study has found, for an estimated maternal mortality rate that is unmatched in any other state and the rest of the developed world. How will Texas avoid even more horrors in this realm if/when Zika hits the state and the need for good maternity care rises precipitously, given the cut in clinics across the state? How is the state preparing to help the populace? The rate at which women die during pregnancy or shortly after childbirth has fallen sharply in many nations as maternal care has improved. The United States — and particularly Texas — is a glaring exception. In Texas, for instance, according to a study in the journal Obstetrics & Gynecology, the maternal mortality ratio — maternal deaths per 100,000 live births — doubled to 35.8 in 2014 from 17.7 in 2000. Compare that with Germany, which had 4.1 deaths per 100,000 live births in 2014. In California, that figure fell from 21.5 in 2003 to 15.1 in 2014, but in the remaining 48 states and the District of Columbia it increased from 18.8 in 2000 to 23.8 in 2014. The United States as a whole had the second-highest maternal mortality ratio among 31 members of the Organization for Economic Cooperation and Development. Only Mexico had a higher figure. Unites States maternal mortality rates are among the highest of members of the O.E.C.D. *Canada figure is from 2012, the latest available. A big part of the problem is the inequality embedded in America’s health care system. The 2010 Affordable Care Act made health insurance more available, but millions of families still cannot afford the care they need. And lawmakers in many states and many Republicans in Congress have repeatedly shortchanged reproductive health programs because of ideological opposition to contraception and abortion. The surge in maternal mortality in Texas defies easy explanation. Such increases typically happen during war, natural disasters and severe economic distress. State Republican lawmakers sharply reduced spending on women’s health care in 2011 in an effort to eliminate government funding of Planned Parenthood. The cuts, which took effect at the end of that year, don’t account for all of the increase, but they certainly don’t aid maternal health. The biggest killers during and after pregnancy in Texas are cardiac problems and overdoses involving prescription opioids and illegal drugs, according to a recent report by a task force created by the Texas Legislature. It also found that maternal mortality was much higher for black women in Texas than for white and Hispanic women. Researchers estimated maternal mortality trends in the United States, accounting for gaps in data collection. In Texas, the rate spiked after 2010, while it fell in California. Texas lawmakers could address some of these problems by investing more in health clinics in minority communities and in mental health and addiction treatment. Expanding Medicaid to cover 1.2 million more poor people would also be very helpful. Texas is one of 19 states that have refused to expand Medicaid under the Affordable Care Act, despite the law’s generous terms, with the federal government picking up nearly all of the cost for low-income families. Texas can also learn from California, which has organized doctors, hospitals, insurance companies and public interest groups in a collaborative to focus on maternal mortality. The group has developed state-of-the-art treatments for causes of maternal death like hemorrhages and pre-eclampsia, a condition characterized by high blood pressure and organ damage. But even California could go further. Despite some improvement, its maternal mortality ratio far surpasses that in nations like Germany and Britain, where it is 6.7 per 100,000. One reason for Britain’s low figure is a mandatory system of confidential reviews, in place since 1954, of every maternal, newborn and infant death to determine what went wrong and how doctors and hospitals can improve. That’s easier in Britain’s single-payer, government-run health system, but it should not be impossible for state governments to develop something along these lines. One of the United Nations’ Millennium Development Goals was to reduce global maternal mortality by three-fourths between 1990 and 2015. 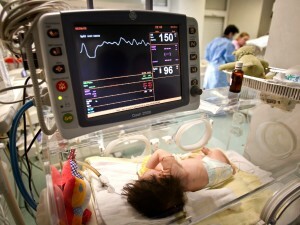 The world missed that target but still reduced maternal mortality by 45 percent. Set against that progress, America’s record is unconscionable. The CDC has issued its preliminary report on US birth data for 2015. 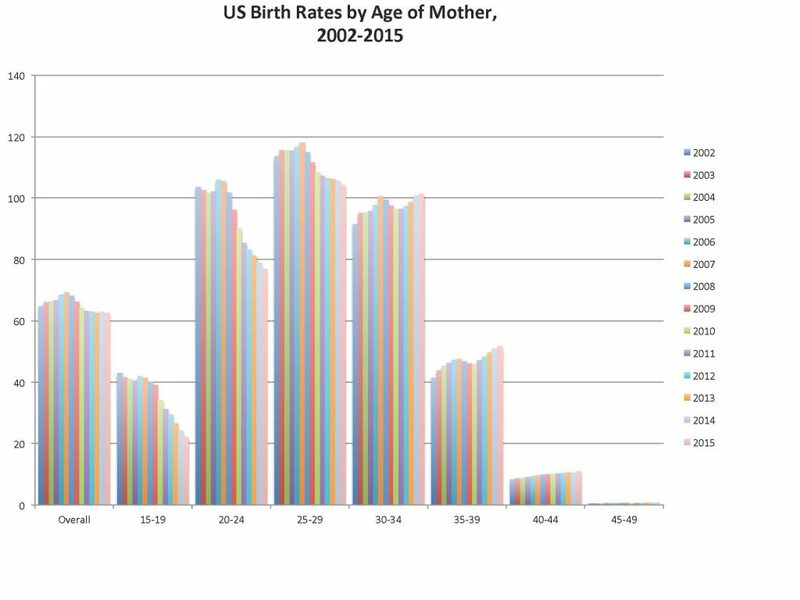 Birth rates are down overall, driven by historic lows among younger women. But rates among women in their 30s and 40s continue to rise. Breaking it out by age: the birth rate for teens fell yet again — decreasing by 8% since 2014, to 22.3 births per 1,000 women, another all-time low in a series of those. Looking more granularly, in 2015 the rates declined 9% among teens 15-17, 7% among those 18-19, and 10% among those 10-14. The teen birthrate (15-19) has declined 46% since 2007 (the start of the recent recession), and 64% since 1991. Among women in their 20s, the rate decreased 3% for women 20-24 in 2015 (with a fall of 27% since 2007); the rate decreased 1% for women 25-29 (with a fall of 8% since 2007, including a less than 1% rise in 2014). Among women in their 30s, the rate increased less than 1% for women 30-34 (with an overall increase of 5% since 2011, when what had been a downturn since 2007 turned up). The rate increased 1% for women 35-39 in 2015 (with an overall increase of 13% since 2010). Among women in their 40s, the rate increased by 4% for women 40-44, for a total gain of 13% since 2007; the rate among women 45+ was unchanged (though the number of births in this age group increased by 5% [from 8443 to 8876], due to an increase in women in this age group, which includes all women 45 and over). The report did not include preliminary break outs by age at first birth or by race — that data should arrive with the rest of the deets in the Final report in the Fall. 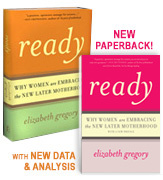 Here’s an overview piece on current fertility research around later motherhood. Among the methods discussed, lab-grown eggs from stem cells (“Growing eggs in the lab like this would yield a great many eggs unaffected by age for older women trying to conceive through IVF. It also would mean women could skip the hormone stimulation harvesting eggs normally requires, though a minor, outpatient surgery to take tissue from the ovary would be needed.”); egg freezing; ovarian tissue freezing; mitochondrial transplants; genetic screening. As the reporter notes, these technologies are very expensive, and so only available to the well to do except in states with mandated coverage. They are also experimental, with varying levels of risk and unknown down-the-line effects on kids and parents. The stem cell route in particular might take us to a future where age is not a factor in whether or not a woman gets pregnant. But even more effective for shaping happy families for the group as a whole would be giving people a supportive social environment for combining families and work, where good childcare wasn’t so expensive that you had to wait to be able to afford it, and where employers didn’t see kids as a drag on their employees commitment to their work. Having the school-day mimic the work-day would be a major means for realizing such a world, while also expanding kids’ learning, if done well and responsibly. Progress is happening on these fronts as well (largely in municipalities, like NYC, DC, Miami, San Antonio, San Francisco) — & effort to improve things in Houston is underway too. Keep it going!